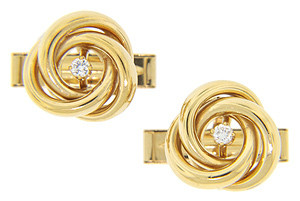 A single diamond ornaments the center of each of these 14K yellow gold retro-modern cuff links. Each link is crafted in a knot design and measures 1/2" in diameter. 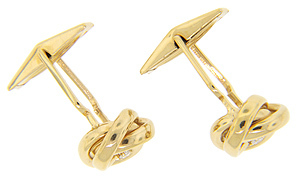 The vintage cuff links also measure 1” in depth, perfect for thick French cuffs. Circa: 1940.